Several upcoming items and events need your attention in the next few days. 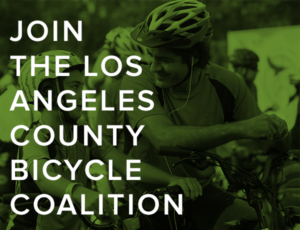 The LACBC is urging you to attend today’s meeting of the City Council Transportation Committee, starting at 12:45 pm, to demand that Measure M return funds be spent to ensure safer and more equitable streets in the City of Angels. 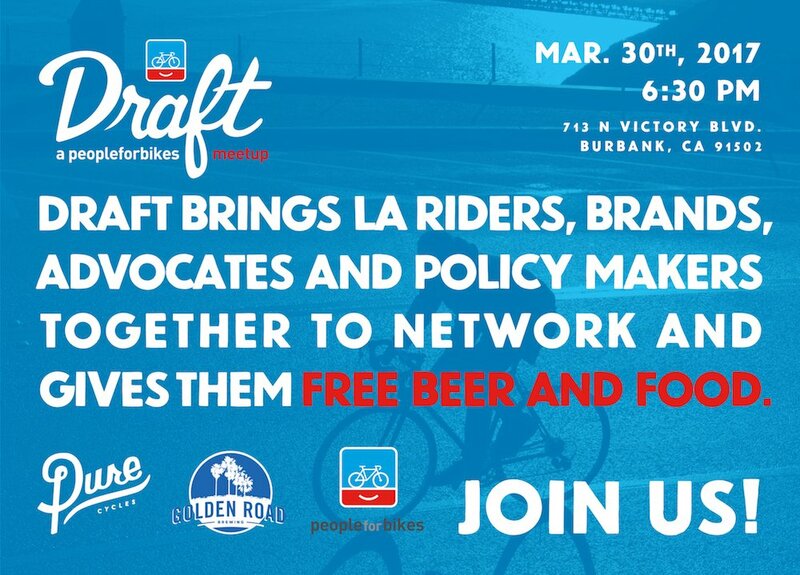 People For Bikes is joining with Pure Cycles to host another Draft Meetup in Burbank tomorrow night, complete with beer from Golden Road Brewing. It’s a Golden Road doubleheader on Thursday, as Finish the Ride invites you to join them for a benefit poker tournament at Golden Road Brewing tomorrow night. It will be going late into the evening if you want to stop in on your way home from the Draft Meetup. Santa Monica wants your input on plans to improve the oceanfront bike path north of the pier, including a much needed proposal to separate bicyclists and pedestrians on the often overcrowded pathway. Bike SGV is looking for help with bike park weeding this Sunday. 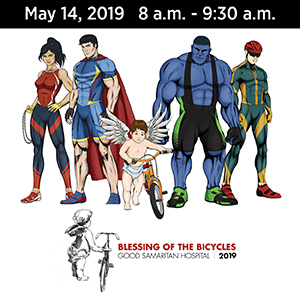 The schedule has been announced for this year’s edition of the Redlands Bicycle Classic; the May stage race is one of just two California stops for the USA Cycling Pro Road Tour this year. Former Italian cycling great Mario Cipollini disses his fellow countrymen, including Vuelta winner Fabio Aru, calling Tour de France winner Vincenzo Nibali Italy’s only talented rider. A sidewalk-riding kid does what we’ve all been tempted to do by shadowing pro cyclist Philippe Gilbert, if only for a few moments. A bike-hating Brit writer gloats over the scandal-plagued British Cycling, while inadvertently making the case for better infrastructure. More great photos and video from Sunday’s CicLAvia. 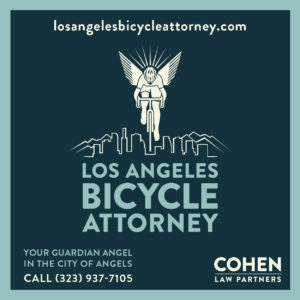 LA parking meister Donald Shoup says the best way to encourage commuters to use alternative transportation is enforcing the state law requiring employers to offer a parking cash out if they provide their employees with subsidized parking. The Press-Telegram reports on yesterday’s all-too-brief mini-ciclovía on the course of this weekend’s Long Beach Grand Prix. Parks and bike paths are included in the mitigation guidelines to offset the environmental damage caused by the Port of Long Beach. Which does not, of course, mean they will actually be built. Calbike wants you to nominate someone who has “worked to advance equitable transportation policy or infrastructure changes” for their 2017 Transportation Equity Award; the deadline is this Friday. California climate officials says state residents will have to reduce driving by 1.6 miles a day to meet the state’s climate goals, through a combination of denser housing and alternative transportation, including bicycling. A San Diego attorney says his bike-riding client won a nearly $5 million judgment against the city because of its failure to promptly fix damaged sidewalks. A Stanford golfer withdrew from a tournament after she was hit by a car while riding her bike on campus. The penalty for riding salmon on an Hanford street while allegedly on meth may have been blindness in one eye. A lawsuit alleges the rider lost his eye when he was cut off, then punched by a cop; needless to say, the officer tells a different story. It’s the end of the road for Seattle’s Pronto bikeshare, done in by the city’s hills and mandatory bike helmet law. Denver residents are using a $75,000 grant from Kaiser Permanente to jumpstart the process to get a new bike lane installed. Colorado bicyclists rally to support a cyclist who was attacked and strangled by a trail-raging runner. The homeless Texas man whose bike was stolen just a week after it had been given to him by Lubbock police officers was given a replacement, by a man who could relate to his struggles because he’d also been homeless. 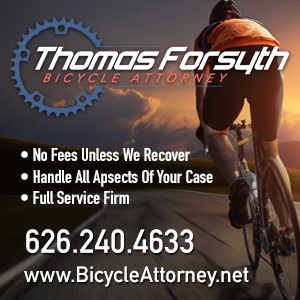 The Chicago Tribune calls for equal enforcement the laws in every section of the city, after a recent report showed that bike riders in minority districts were far more likely to be ticketed than riders in mostly white neighborhoods. A Cleveland website examines the state’s laws governing bicycling, including the right to take the full lane. Don’t swing bikes, dude. The Philadelphia bike cop who was filmed swinging his bicycle at an anti-Trump protester is now being investigated by Internal Affairs. In a truly bizarre case from Virginia, police shoot a suspected bike thief who suddenly lunged at an officer with a knife, even though the suspect was the one who called police to report the theft. A Savannah GA writer says bike lanes are not just about cyclists, but form a vital link for people “who use wheelchairs, scooters, walkers, and other mobility aids.” Although judging from the picture, that one looks woefully substandard. Cape Coral FL is considering a $63 million plan to add 200 miles of bike paths and sidewalks, after recently being named the most dangerous city for pedestrians in the US. A cyclist in the UK accuses his town council of waiting until someone gets killed before fixing a dangerous junction. Which is exactly what happened in Atlanta, where a father says a road diet could have saved his daughter’s life. Sadly, that seems to be what it takes before things get fixed, just about anywhere. And sometimes, not even then. Police are looking for a road raging British driver who followed a driver home after a dispute, and threw a brick through the car’s window. It’s been a rough year for Irish bicyclists, and it’s only getting started. The Guardian says bikes are good for more than moving people, suggesting that carrying freight by bicycle could free up roads and transform cities and towns. Although Dutch bicyclists are complaining that the boom in cargo bikes is crowding them out of the bike lanes. An Indian driver claims his brakes failed when he crashed into two cyclists, a cycle van, a motorcyclist, a pair of pedestrians, a car and a bus, injuring ten people in the process, including the passengers in his car. And swears he only fled the scene because he was afraid of being lynched by angry bystanders. Which could be true, given the county’s track record. A Canadian cyclist riding through India is being held by Maoist soldiers. Nothing like riding nearly 2,000 miles in just five days without leaving the house. If you’re going to ride your bike with heroin in your pocket, put a damn light on it — and try not to hit the curb when you try to ditch the smack. And seriously, don’t ride your bike in the supermarket.